The first truly dwarf variety of pear in New Zealand, growing to just 3m tall. Deliciously sweet-flavoured fruit with smooth, soft flesh and green and mildly russet skin. Ripens in mid-summer and stores well. An attractive tree with white spring blossoms, glossy summer foliage turning to golden-orange autumn tones. 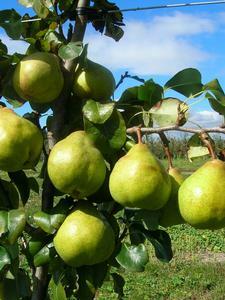 Best planted near another Pear or Nashi variety for cross pollination. Pears require at least one pollinating variety to ensure good fruit production.